$0.89 & FREE Shipping on orders over $59. 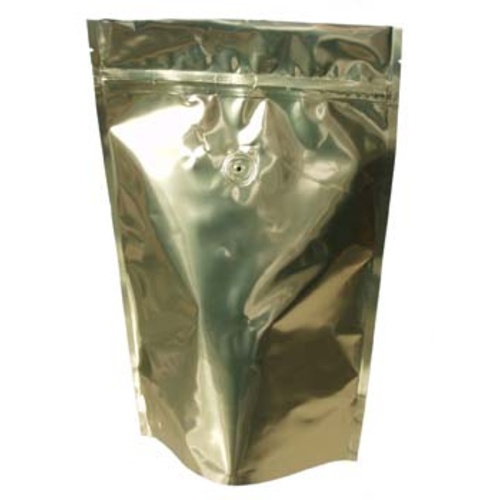 Store up to 1/2 pound of coffee in this one-way valved foil coffee bag! The valve allows carbon dioxide expelled from freshly roasted coffee to escape, prevents any gases (oxygen especially!) from entering and staling your coffee. To store my coffee properly. I used some Zythos about 4 months ago and resealed them in these bags. I sporatically check the bags in the freezer to see if any hop scent was noticeable. My thought is if you can smell the hops then the seal is no good. So far, they are holding up very well. I bought a couple of these bags shortly after I purchased a few pounds of hops in bulk. As soon as I opened a couple of 1lb bags to use them for a brew I stored the remainder in these valved bags. I was able to get more than the stated 1/2lb in the bag, 12oz of pellets was what I was able to get the bag to hold. I pressed out all the air I could and then stored the valved bag inside a quart ziplock to get a little more protection for the hops. I wouldn't store hops in these bags for a year or more but for short term storage, in my case 6 months or so, they work well. You can quickly get to the hops without as much hassle as opening and resealing a vacuum sealed bag. The price is very reasonable for the quality of the bag. I'll probably pick up a few more the next time I order. Reseal those hops you plan to use pretty soon. Nice to keep in the freezer.